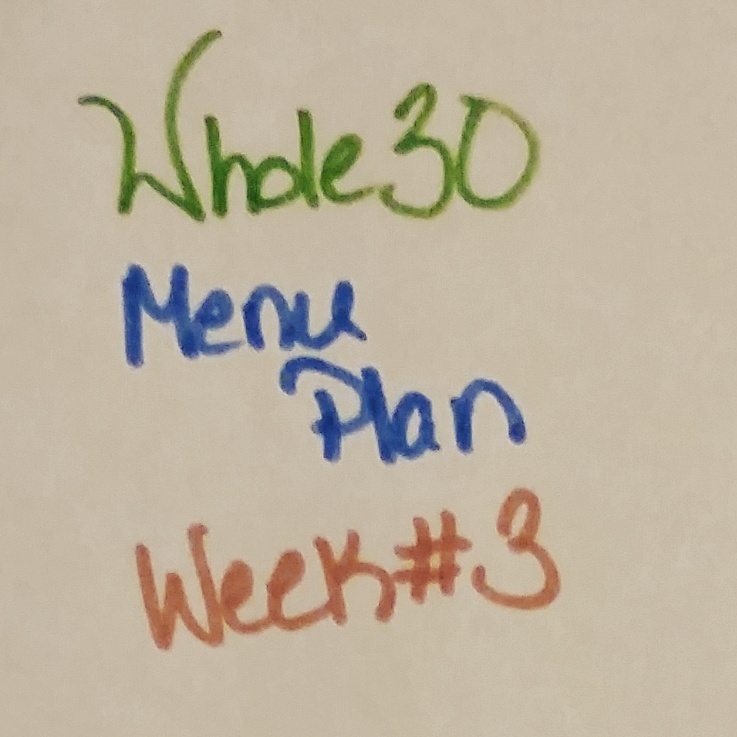 Menu Plan Monday: Whole30 Week 3 | Pa-BLAM! Today is day 16. That means I’m over the halfway hump and it’s all downhill from here. I’m really starting to believe that I can and will finish this. I can make it 14 more days, no problem! This last week was rough, though. I was very, very aware of all the foods I couldn’t have. I did some reading, and it’s pretty normal for that to happen. According to the official timeline, I should be hitting the boundless energy/Tiger Blood stage right about now. Fingers crossed it happens pretty soon. It might have already happened, and my complete lack of sleep the past two nights is negating it. I guess I should stop rambling now and get to the point of this post: the menu plan. I’ve been trying to get this posted all day, but Grayson hasn’t let me. He’s sleeping now, but he’ll probably wake up any minute. That’s how it always goes, right? I only have one more week (and one day) of Whole30 menu planning after this… then I’m not sure what will happen. I actually have a lot of anxiety about it. Daniel and Trinity expect me to jump right back in and make normal food. I feel like I should slowly reintroduce stuff. Maybe I should do mostly eating like this and a few days of ‘regular’ food. I don’t know! Having an anxiety disorder is not fun sometimes. Want more menu planning goodness right now? The Vampire Diet has some yummy (non-Whole30) things planned! I hate to ask… but what are you having this week? I’ll probably be jealous, haha. This entry was posted in cooking, menu plan monday, whole 30, whole30 and tagged anxiety, cooking, food, menu plan, menu plan monday, menu planning, paleo, recipes, the vampire diet, weekly menu plan, whole 30, whole30. Bookmark the permalink. I hope you start feeling more energy soon, Pam! The photos of your dinners that you have been posting on Instagram look very good. I’m sure your body is getting healthier day by day. By the time I got around to reading this – it’s been almost a week so you are nearly done! Are you feeling the Tiger Blood yet?